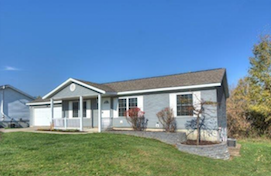 Welcome home to this beautifully maintained ranch home at the end of a cul-de-sac. This affordable home is in move-in condition and has many upgrades. The open great room has a warm and cozy gas fireplace with stylish tile surround. The kitchen and dining area adjoin the great room, perfect for holiday entertaining! 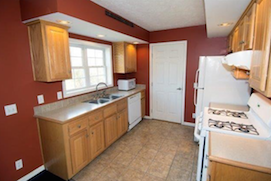 The gorgeous flooring in the eating area and bright galley kitchen will serve you and your guests well. There is a large deck just beyond the sliding doors in the dining area. it’s ready for a grill and fun! With three ample sized bedrooms, including a master suite you will be very comfortable. The bedrooms are fresh, feature wall-to-wall carpeting and white blinds on the windows. The master bathroom has a spa tub, luxury indeed. A second full bathroom is perfect for residents and guests. A full basement with daylight windows is ready to finish. Do you need a game room, media room or home office? This lower level could be all three! The lovely lot is over an acre, and has plenty of privacy. Make an appointment and you will be happy you did. Don’t miss out on this piece of Ann Arbor Area real estate!